Ok, so technically, there are only 4 challenges per month for the NCC. 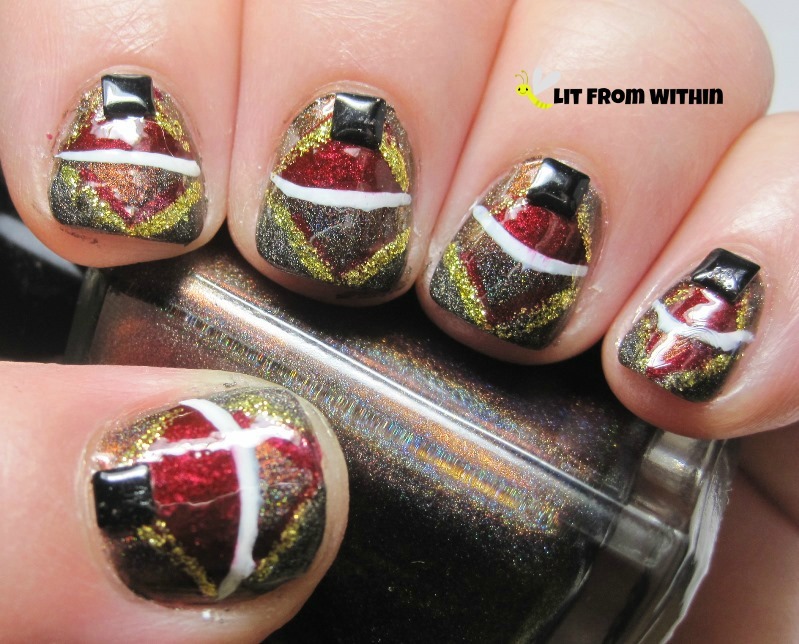 I usually do my NCC challenges on Wednesdays, and there are 5 Wednesdays this month.. so, before I knew it, I had done a 5th Movie/Music/TV mani. So, for your enjoyment, I present my 5th challenge for April, based on a song that was used in a movie. 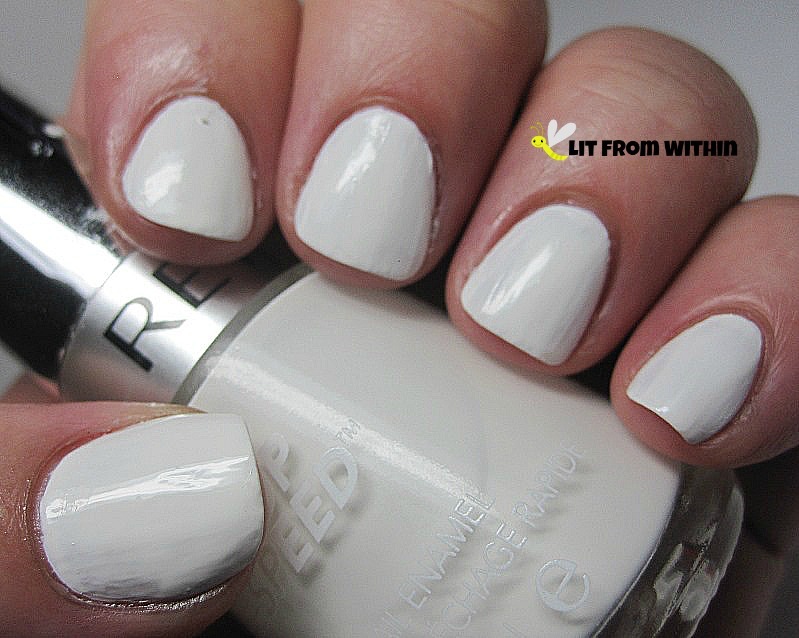 A blank slate, with Revlon Spirit. 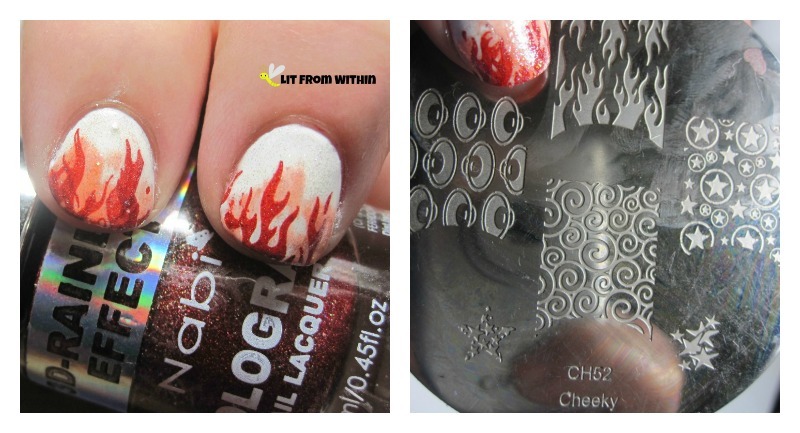 Flames..hmm.. 'the heat' stamped with Cheeky 52 and Nabi Red, with a bit of Julep Kyla dabbed on. A little sparkle from L'Oreal The True Diamond - 'the light'... 'the light, the heat'. And a little dude holding a boom box. If I could draw, he'd be wearing a trench coat. And, finally, the eyes! "In your eyes, the light, the heat; your eyes, I am complete. In your eyes, I see the doorway to a thousand churches..."
Yeah, I wasn't even going to try drawing a thousand churches. Here's basically the whole movie, Say Anything, set to the awesomeness that is Peter Gabriel's, "In Your Eyes," the song that broke every girl's heart watching this movie. "I gave her my heart, she gave me a pen." 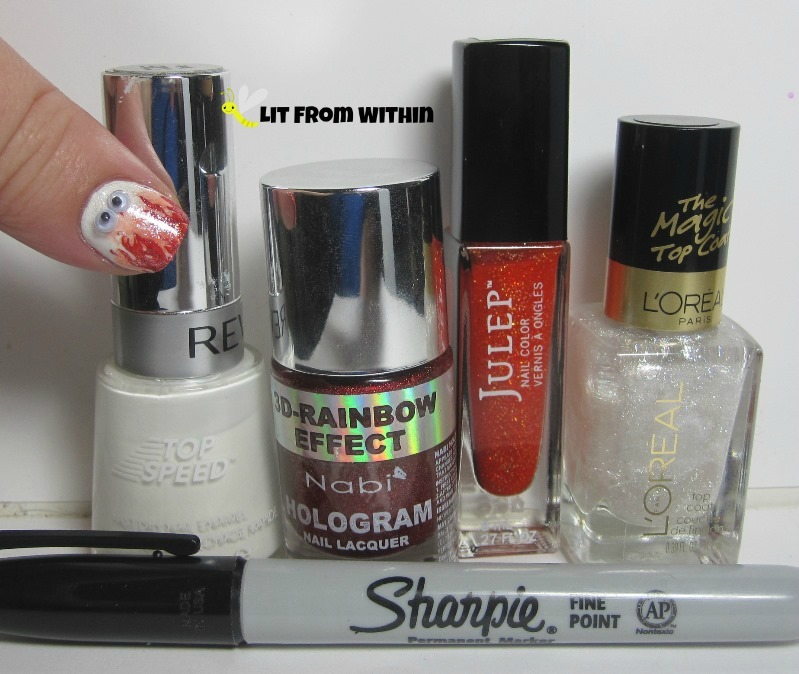 Bottle shot: Revlon Spirit, Nabi Red, Julep Kyla, L'Oreal The True Diamond, and a Sharpie. 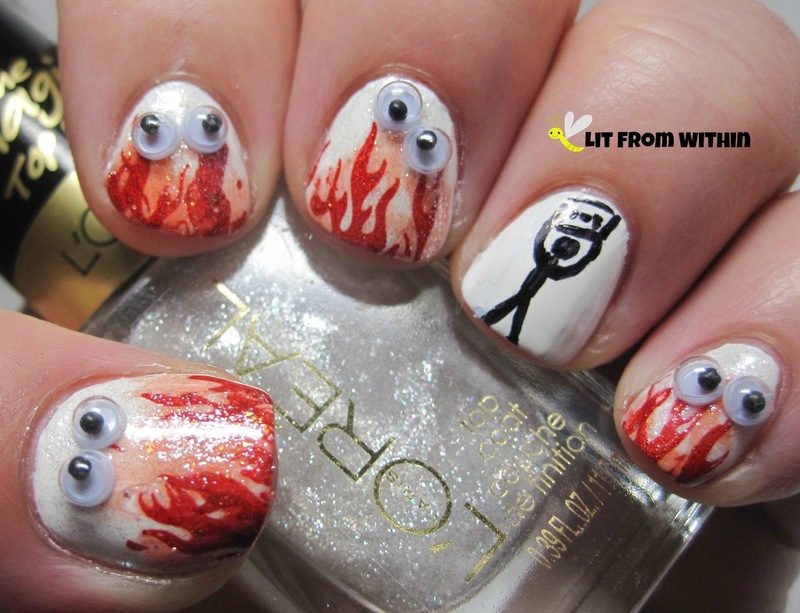 'Put googly eyes on your nails," my husband said. "Put googly eyes on and it'll be like that movie. It'll be fun," he said. 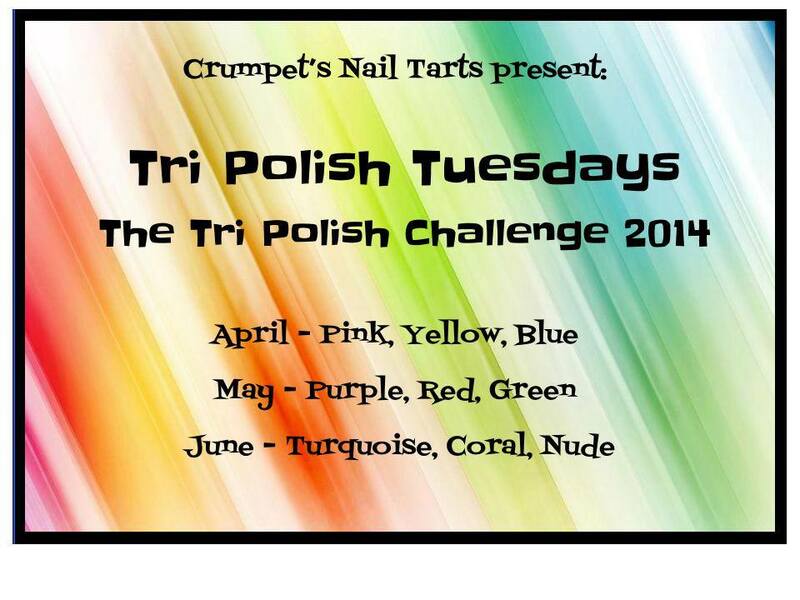 I foundered a bit here and there this month with this challenge. Getting in all three colors caused me a bit of a mental block at times! So, here, at the last, what can I do? First, start with an absolutely gorgeous bluish-periwinkle holo. 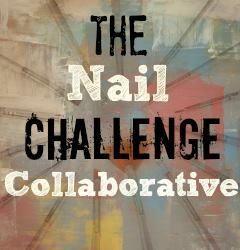 This is Cult Nails Intriguing. 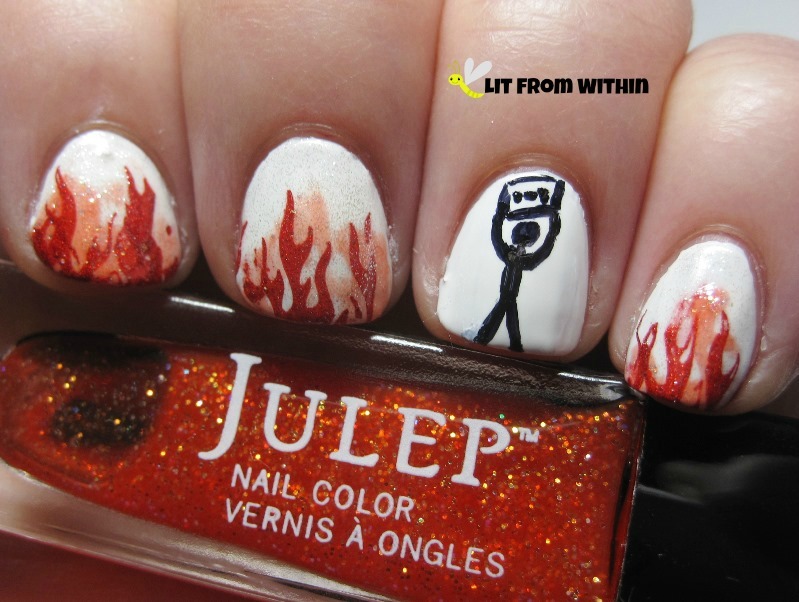 Next, pull out some nail art pens. I found these Hot Designs pens at Target. They're kinda cool because they have both a brush, and a squeeze fine tip. Because of this, they're refillable, too! My only complaint is that I had to squeeze a little hard for some of these, which got uncomfortable after a while. 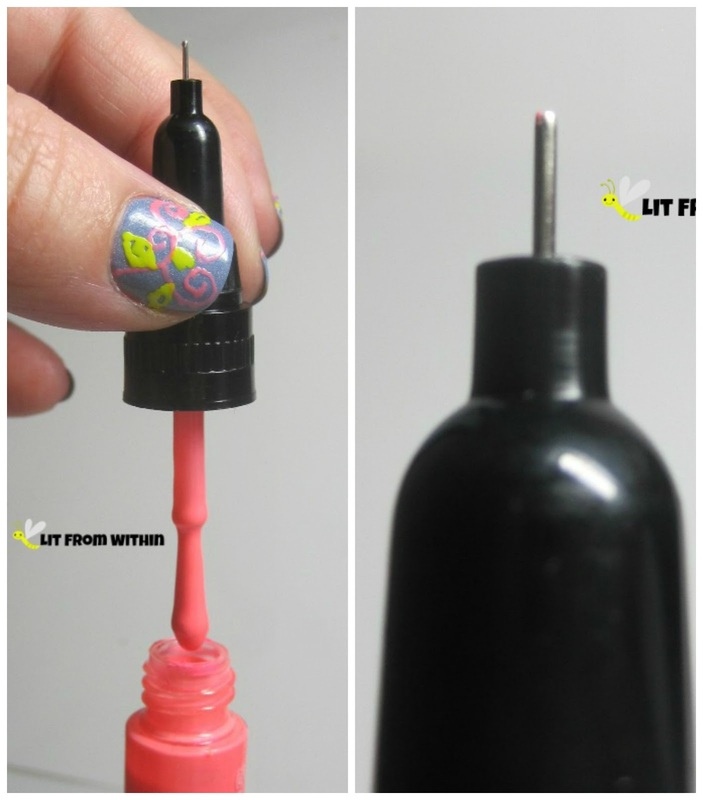 Not sure what to do with your nail art pens? Squiggles and scrolls. Sure, I might have been trying to make something, but you'll never know that it wasn't just squiggles and scrolls. It's a foolproof plan. I think this is one of those tools that will give me better results with a little practice! What was the last thing you tried to do that you wondered if you'd ever get it, and then, it just came together? Today's look was inspired by jessuhhhkuh on IG. 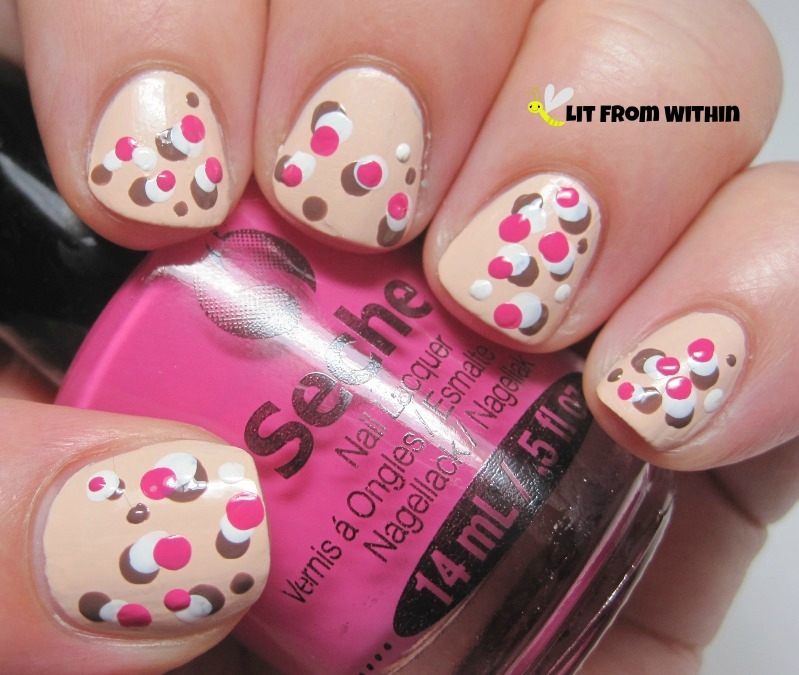 I loved the pink base, and the way she did the triple dots, but I wanted to change up the color scheme a little. I didn't realize I was going for a Neapolitan Ice Cream look, but that's what happened! Who wants ice cream? SephoraX Invincible is a pale, pale pink creme. This was three coats - typical patchy pastel, but I think it leveled out okay in the end. One of those classy neutrals that looks good with everything, but I am not really classy enough to pull off. I used Laura Mercier Bare Mocha for the first layer of dots. I love this chocolate/taupe kind of color. So soft and pretty, and the formula was really nice, if a little thin. I got this in a set from Hautelook, which has become my go-to site for Laura Mercier products. Revlon Spirit was the white I grabbed for the next layer of dots... and promptly dinged my hand on something. How I ever finish a nail art is beyond me, I can never keep from banging my hands on everything in sight. Luckily, we have another layer of dots, and they will be strategically placed! That bright pop of pink is Seche Snapdragon. Love! What a bright, cheery pink. I'm always amazed at the transformation with topcoat. All the dots just melt into one layer. Bottle shot: SephoraX Invincible, Laura Mercier Bare Mocha, Revlon Spirit, and Seche Snapdragon. Here's your personality test: Which do you see? Dippin Dots Ice Cream, or deranged, crazy pink eyeballs? Which will you see when you close your eyes tonight when you go to sleep? 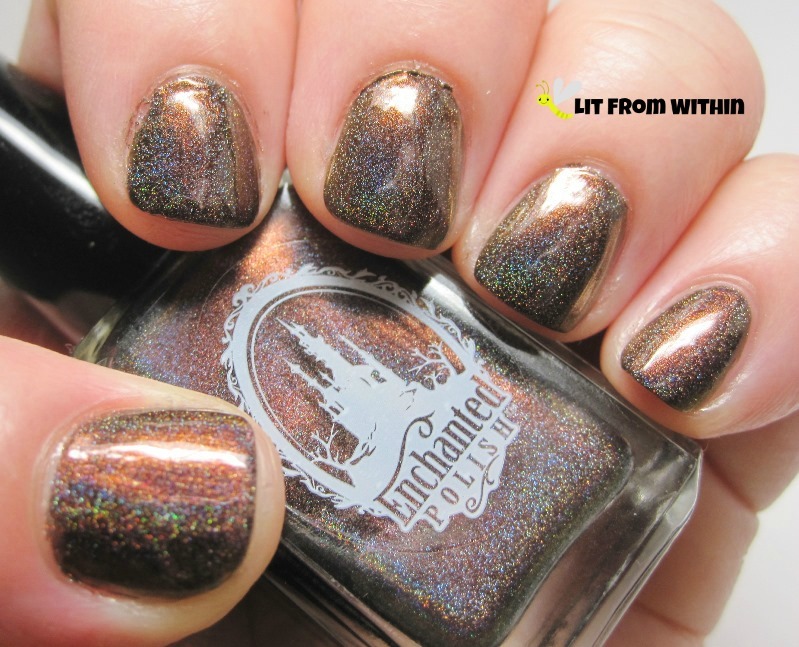 If you missed it, my DermOrganic review went live earlier today! Check it out HERE. I recently had the chance to try some products from the DermOrganic line and give my honest review for y'all. Here's what I received: Hand and Body Moisturizing Lotion, Soapless Facial Cleanser, Daily Moisture Renewal, and 100% Pure Argan Oil. 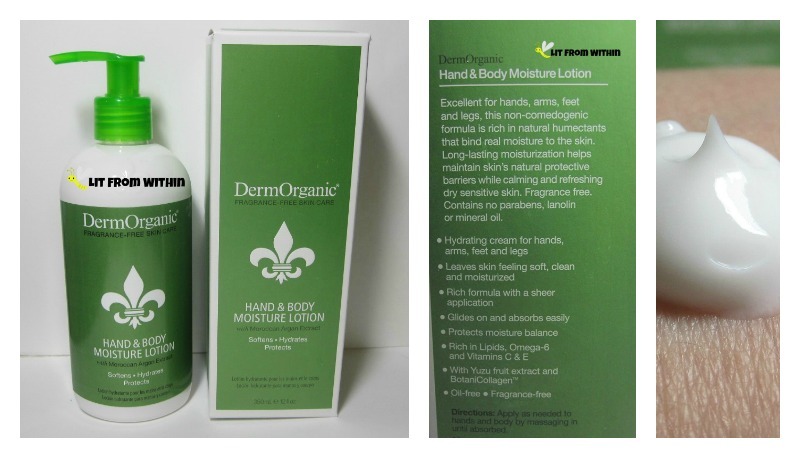 Let's start with the DermOrganic Hand and Body Moisturizing Lotion, which was one of my favorites. Originally, I put this in the bathroom, to replace my regular lotion pump, but then my husband said he really liked it as a massage lotion for me, so it got moved right next to the bed! Yes! It's one of my favorite lotions - a light, kinda herbal-y scent, not greasy, very soft and pillowy, and rich. 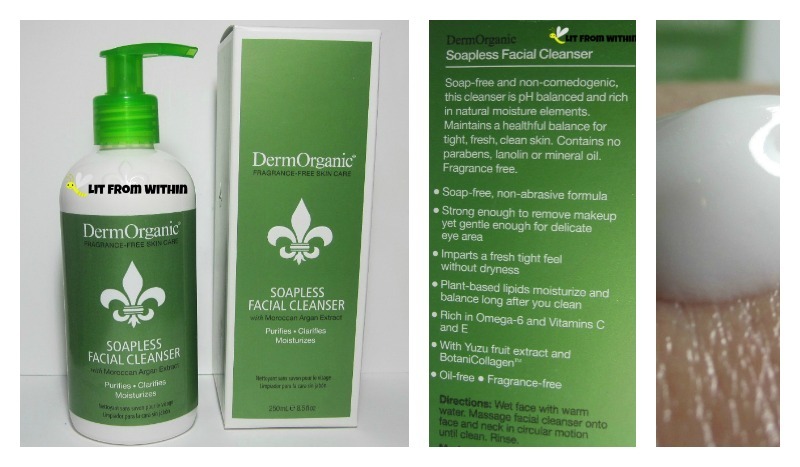 Next, the DermOrganic Soapless Facial Cleanser. This is a luxurious, creamy cleanser. I'm not sure it was the best for my oily skin - it just didn't feel strong enough? It didn't take my makeup off, either. I started using it lately with my konjac sponge and I like it better that way. 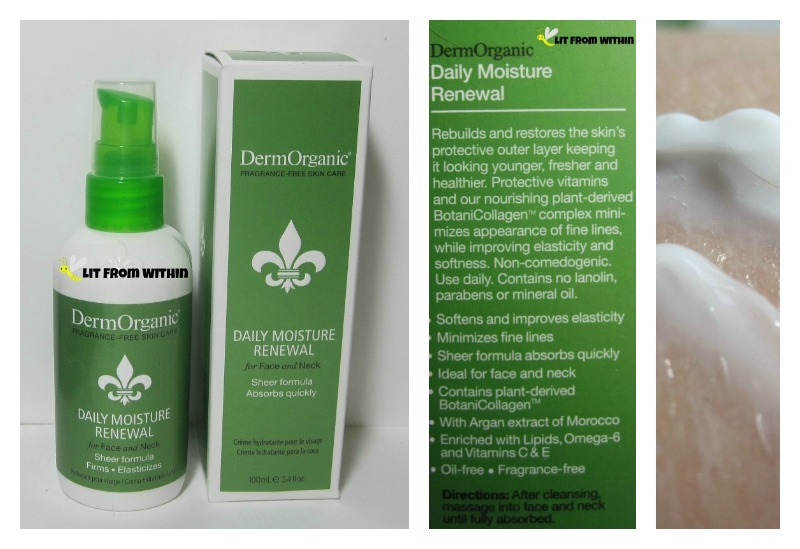 The after-cleansing face lotion is DermOrganic Daily Moisture Renewal. 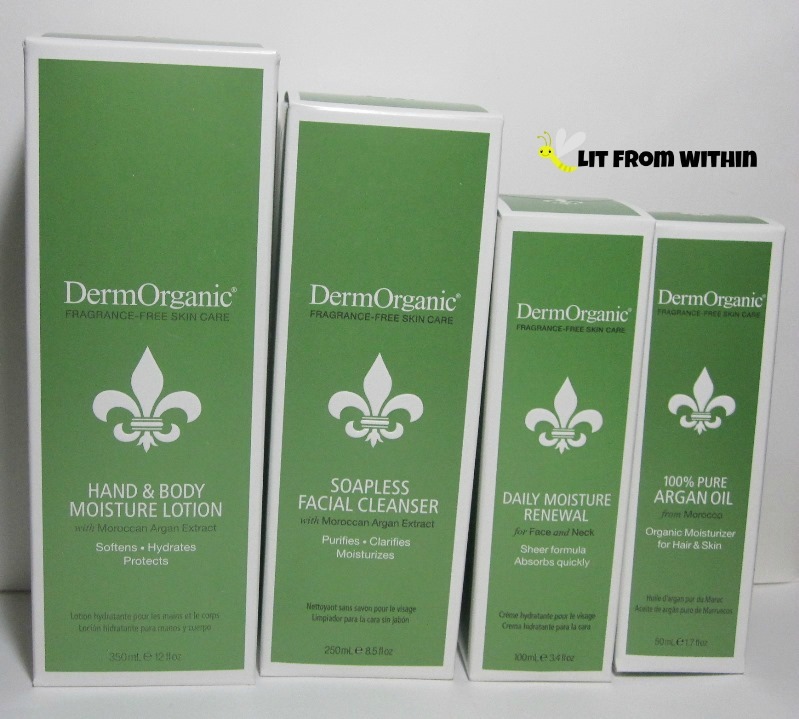 Like the other DermOrganic products I've tried, it has a very light herbal scent, which I like. A lot of 'fragrance-free' products have a really off-putting smell - I've never found any skin care product that was truly unscented, but this is pretty close. This lotion is in a pump, which I really like. About 1 and a half pumps is enough for my face and neck, and it absorbs quickly. If I put this on right after my shower, my face was ready for primer and makeup when I was. 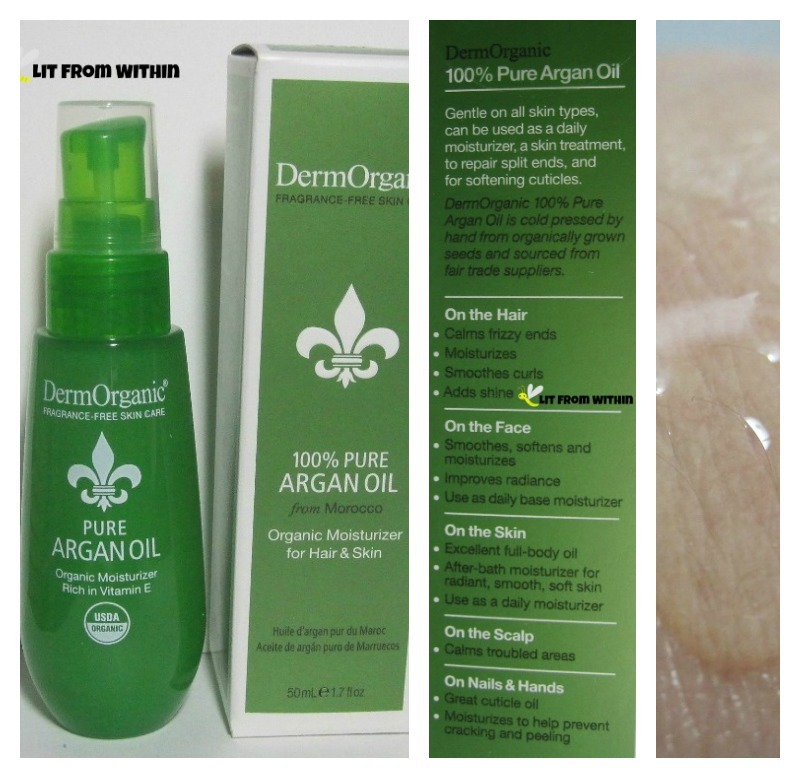 The product I was most excited to try was the DermOrganic 100% Pure Argan Oil. I love oils. I use them all the time, everywhere. I don't think my skin was ready for 100% Argan oil, though. To be honest, I don't know which of the products was responsible, since I started using all at the same time, but when I first used these, I got the biggest, most painful, under-the-skin pimple I've ever gotten in my life. I stopped using this on my face, but I still like it on my hair and hands, but only at night. I received a sample of DermOrganic Hair Masque from Ulta, and thought I might as well include it here. I have a ton of thick, curly hair that can be coarse and frizzy. 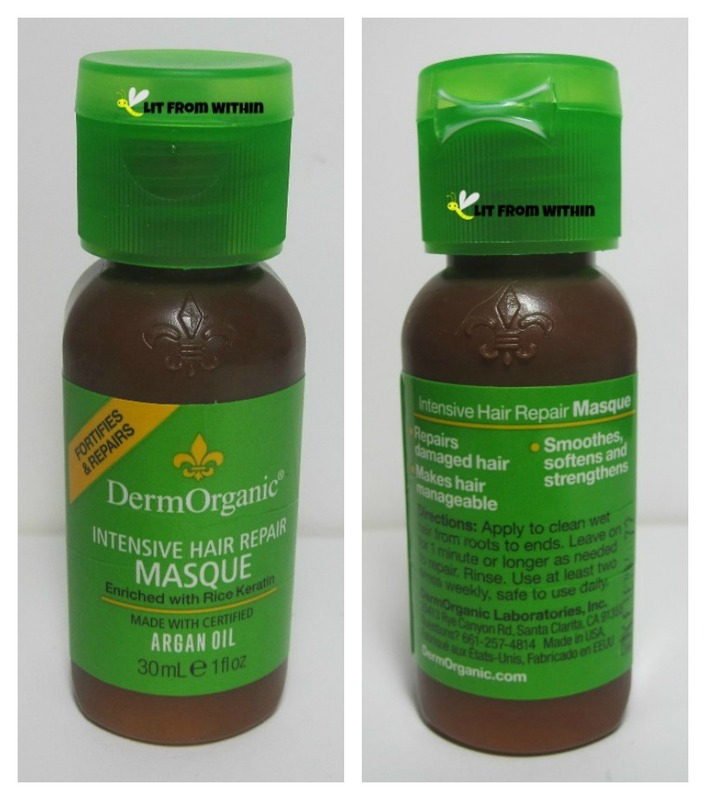 I have used so many different conditioners and products, but I've never used a hair masque. I didn't think they'd be different from a deep conditioner. I was wrong. This is a sample, so I used the whole bottle in one go. 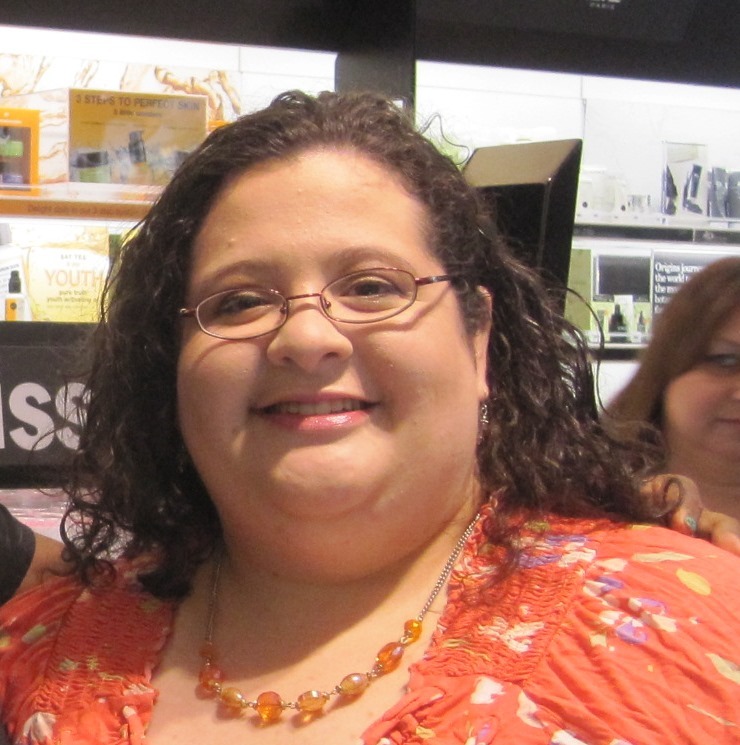 I did use my normal products in my hair afterward, but my hair never felt this good before! Shiny, soft, manageable. Amazing. I went out that afternoon, and here's a picture of my hair from that day. My hair is DOWN! And it's not huge and frizzy! This is a really great line of products. Natural, and cruelty-free, too. Aside from the one painful pimple that only happened once and did go away, there were no other adverse reactions. It may be that folks with dry or normal skin wouldn't have that problem, but the older I get, the more oily my skin is getting! After about a month of use, my skin is soft, and after one use of the hair masque, my hair feels great. Ulta does not (yet!) carry the skincare items, but they should have the pure Argan oil on shelves between May and July. If you'd like more information, or to order DermOrganic products, they have a website, Facebook page, and Twitter. Two posts today! 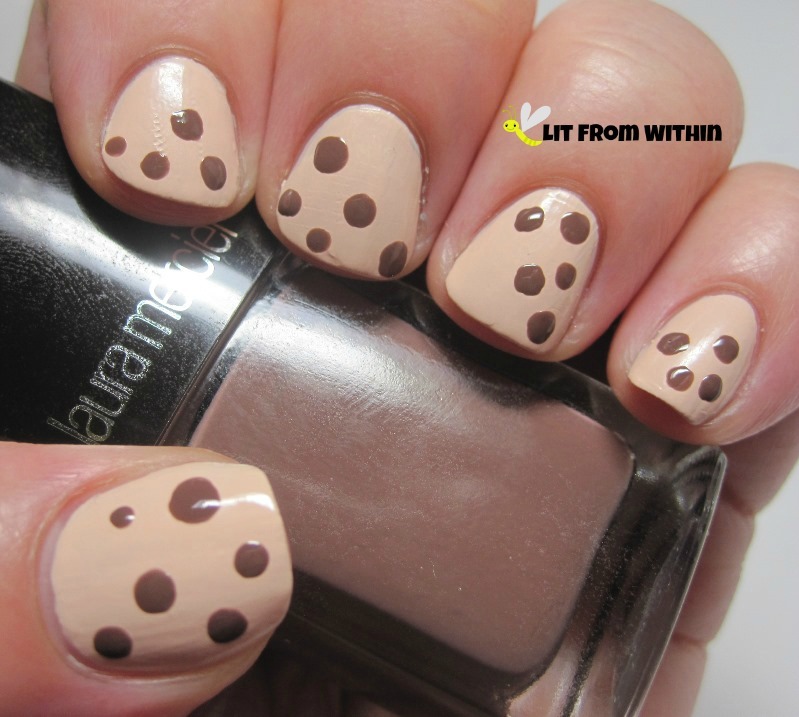 If you'd like to check out my Dippin' Dotticure for #NailArtForNubs, click HERE! 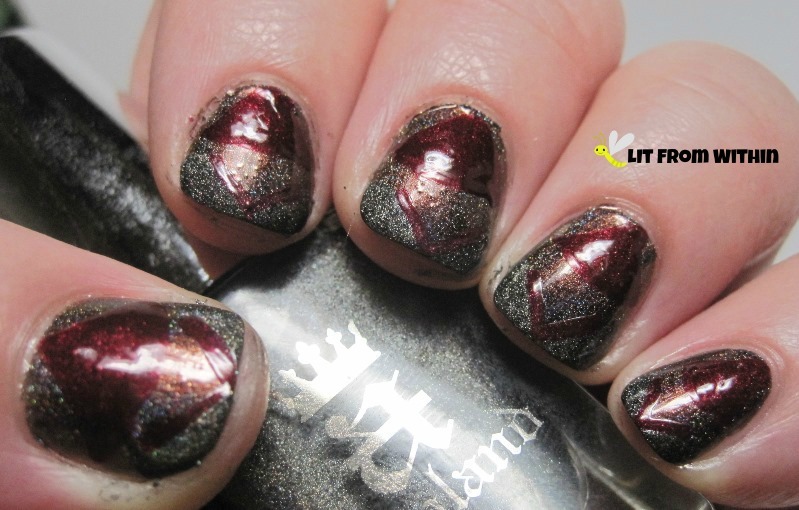 Today's Sunday Stamping theme is "Bada$$ Nails". 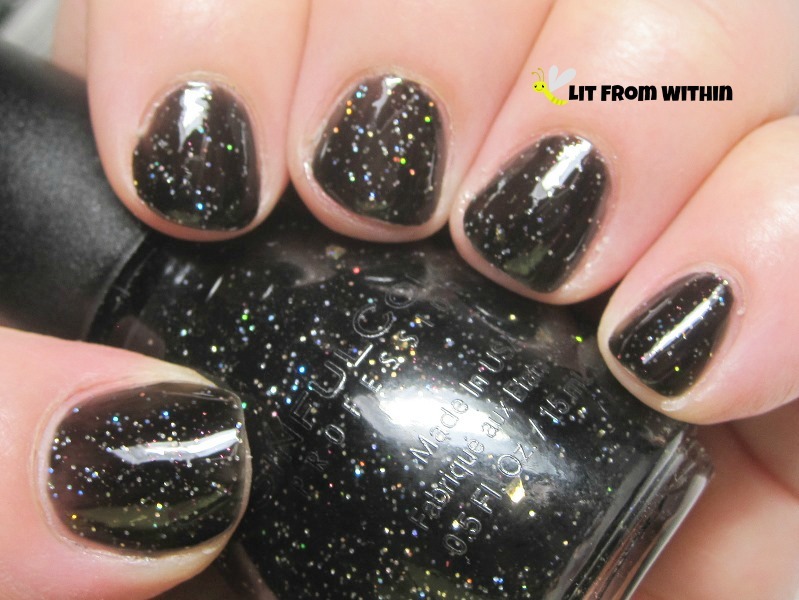 When I was a kid, there was no more badass nail color than black, so I picked this cool black with holo glitter - Sinful Colors Starry Night. Does this look like a $2 ($1 on sale!) 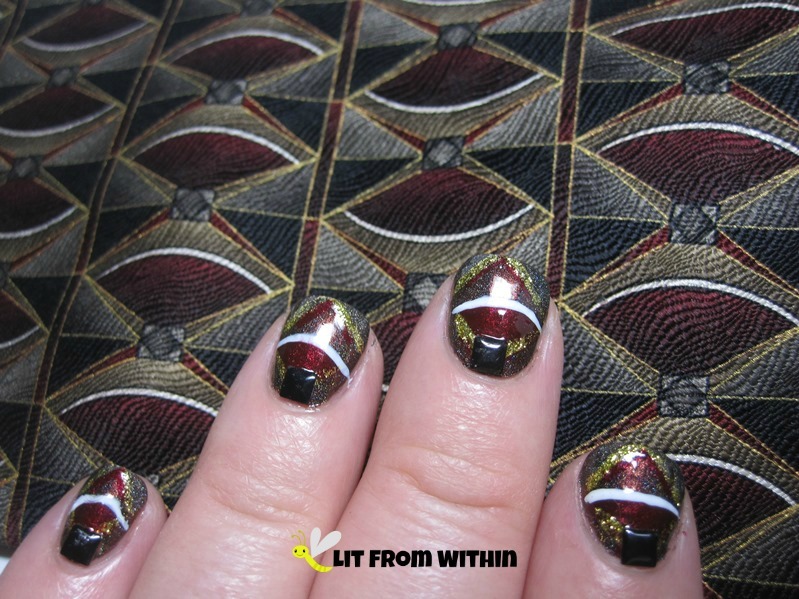 polish? It doesn't behave like a cheap polish, either. I love Sinfuls. 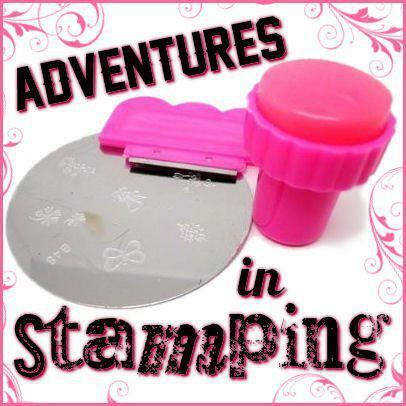 I bought this stamping plate from Born Pretty Store on sale. 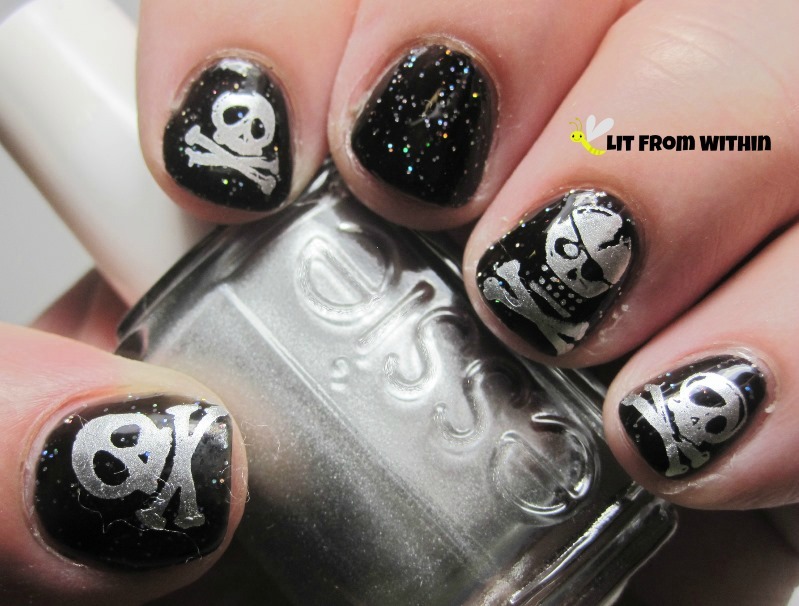 I loved the cute, sad skull and crossbones! I also liked that there were two sizes on the plate, because, as you know, I haz nubz. 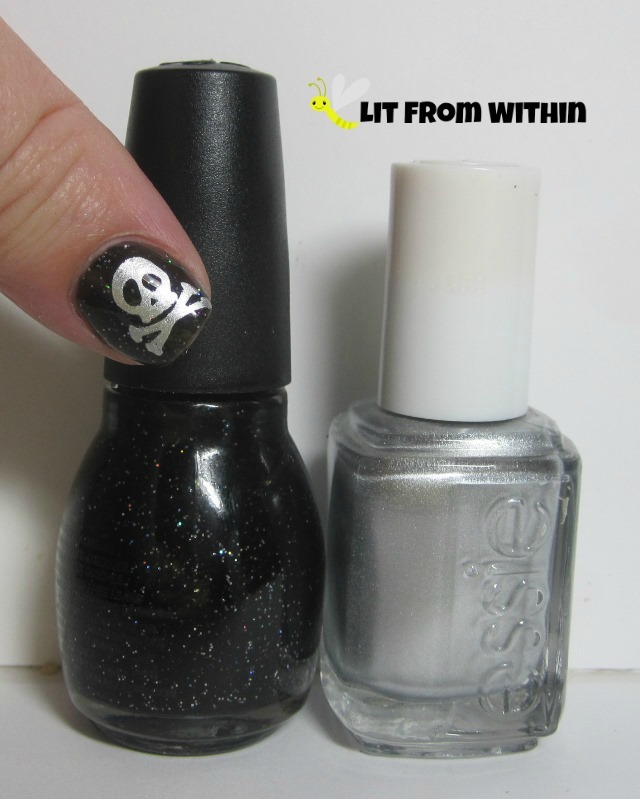 I used Essie No Place Like Chrome, one of my fave silver stamping polishes, to stamp the skulls. 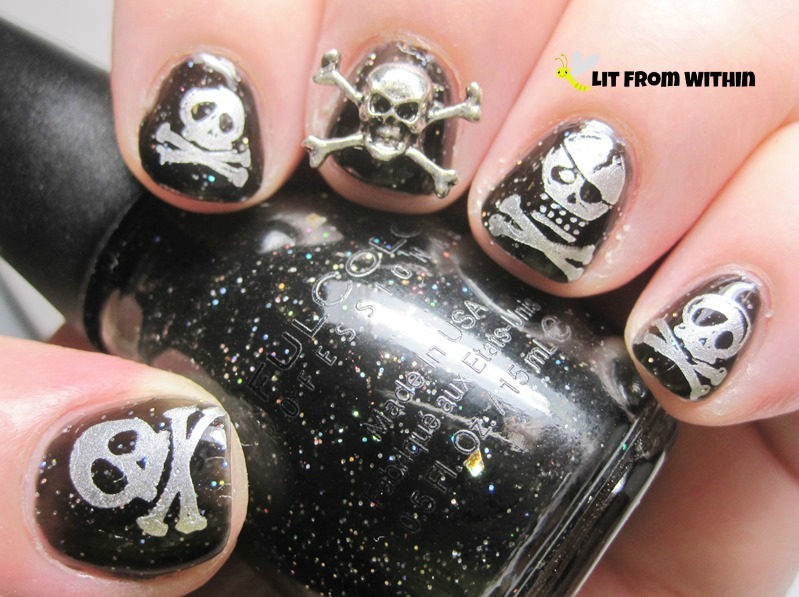 The larger skull fit on my thumb, but I used the smaller one on my index and pinky, and the pirate one on my ring finger. Why did I leave my middle finger blank? For an awesome 3-D metal skull! Now, that's Badass. 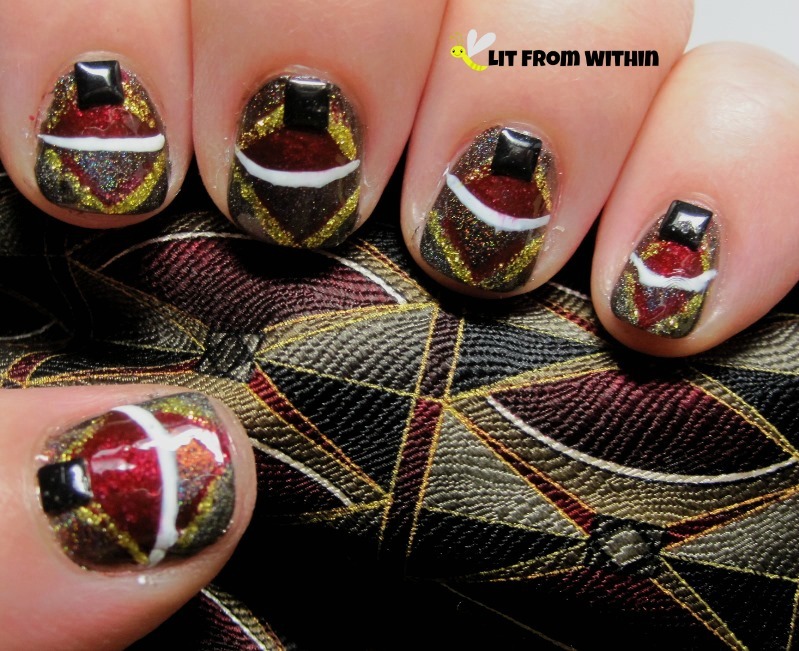 Don't mess with me, I'll poke you with my nail art! 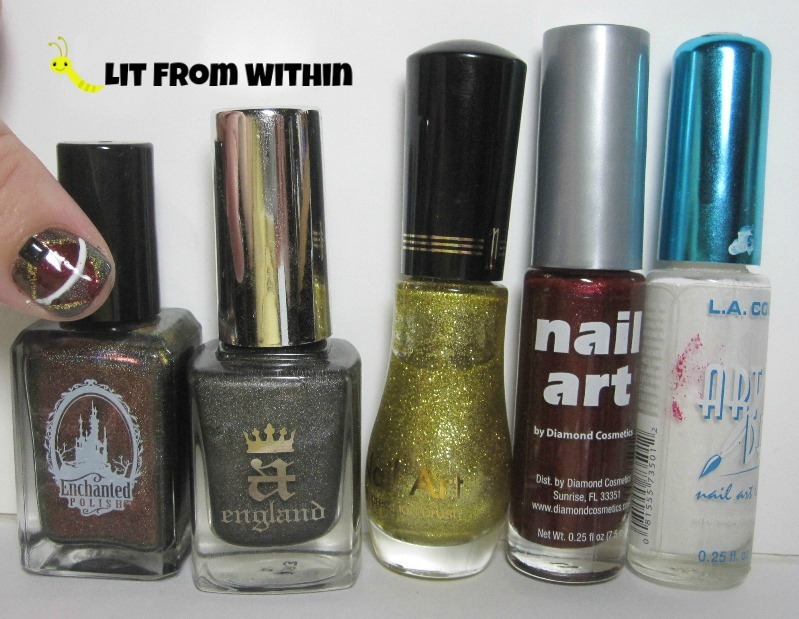 Bottle shot: Sinful Colors Starry Night, and Essie No Place Like Chrome. 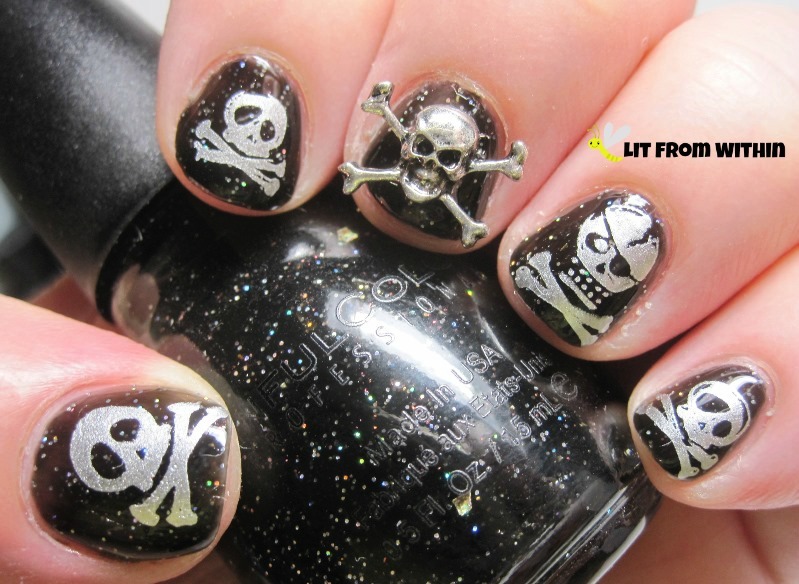 What's your version of a badass mani? This may be the Pantone year of Radiant Orchid, but this season is all about coral. I love it in so many different variations - the electric, soft, more peachy, more pink - all of a sudden, I can't get enough. 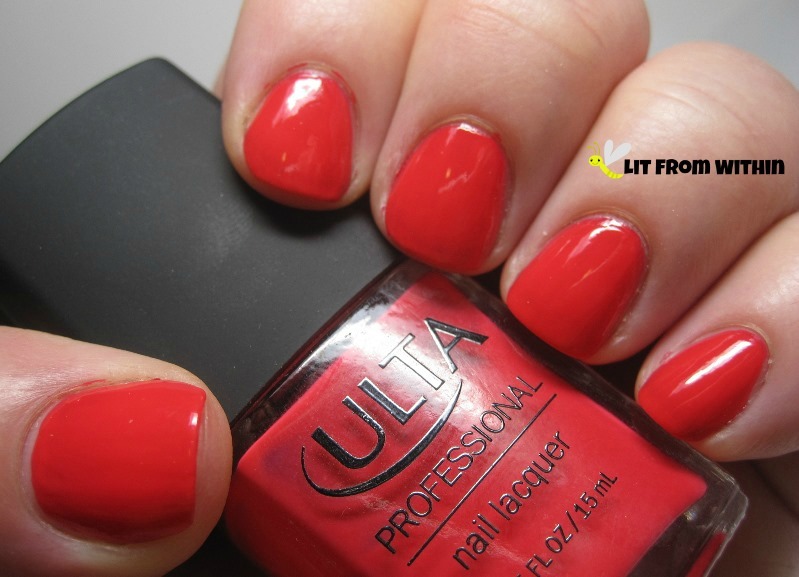 This is Ulta Professional Cabana Coral, an electric reddish-coral. 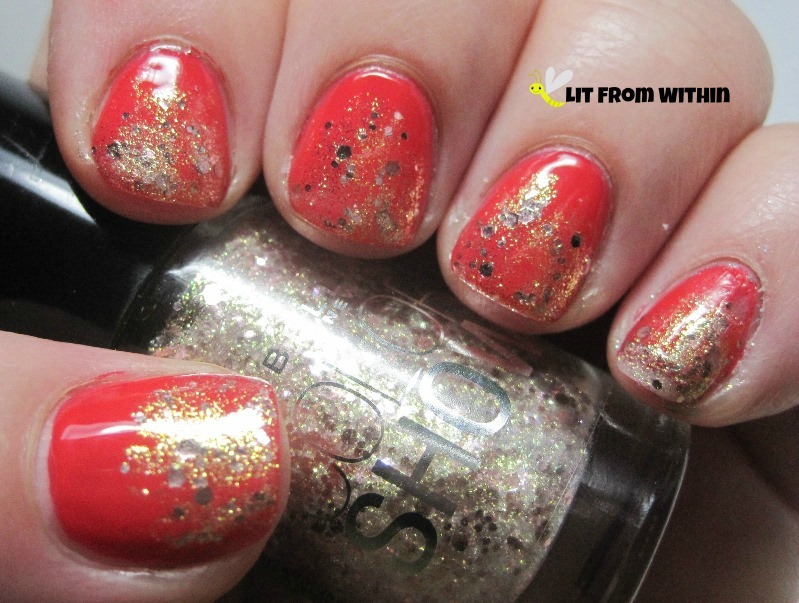 This is going to be a pedicure fave for me this summer, I'm sure! I did a gradient with Maybelline Gilded Rose, a rosy gold shimmer with glitter. Shouldn't that be a gilded lily, as in 'don't gild the lily,' not a rose? People and their mixing of metaphors. Bah. 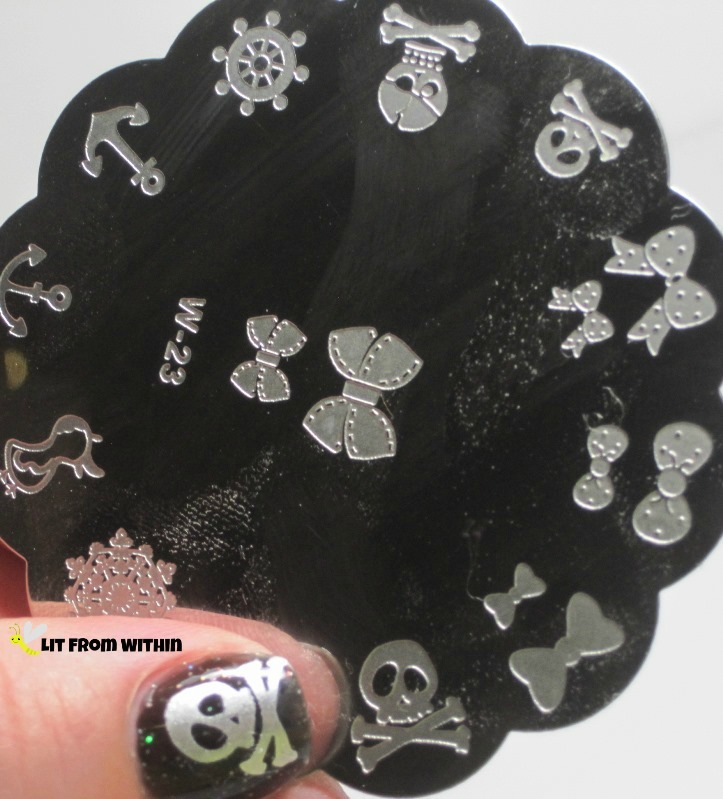 I'm not a crafty person, but somehow I decided that I wanted to make my own acrylic doodads for my nails. 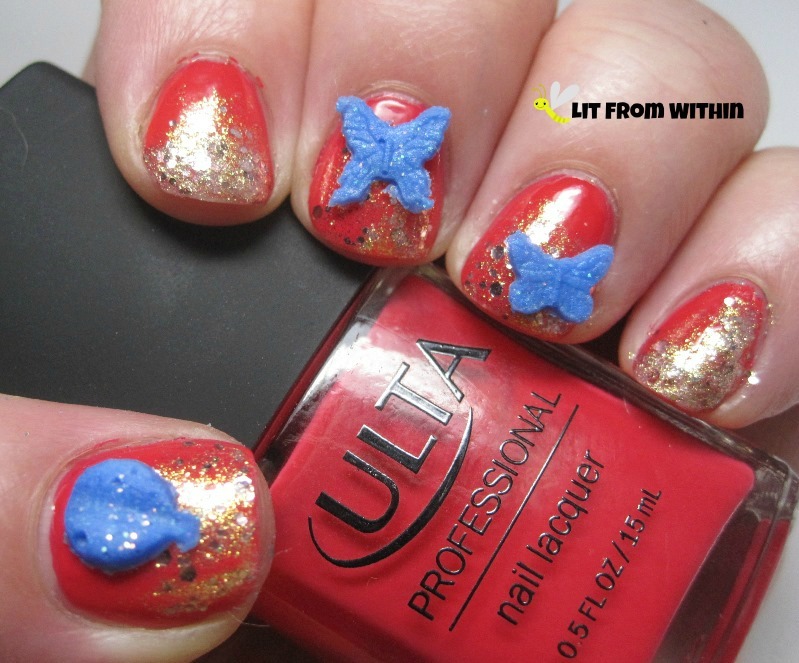 I bought some acrylic powder, pigments, the monomer, and some molds, and I used some glitter I already had, and mixed up these blue glittery butterflies, and what I hoped looked like a hot air balloon. 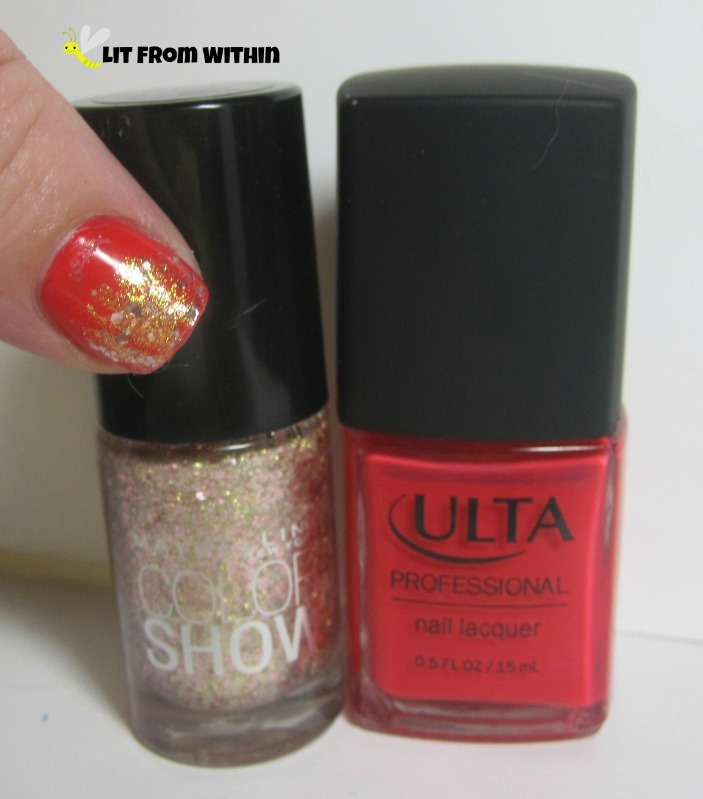 Bottle shot: Maybelline Gilded Rose, and Ulta Cabana Coral. 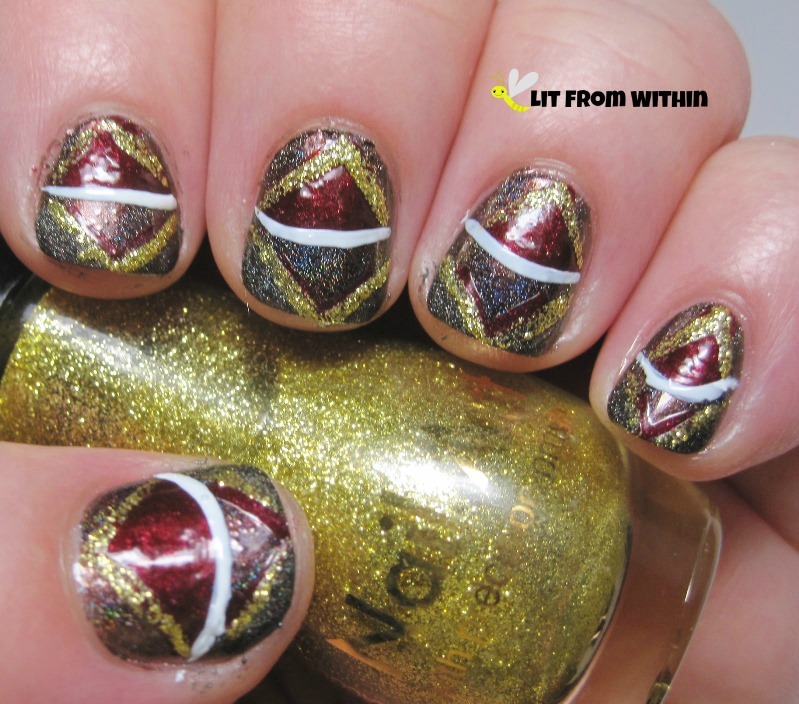 I don't know why, but my latest fascination with nail art is to stick things on my nails. I can't keep them on, because I pick everything off, but I love it. I'm finding all kinds of cool 3-D stuff on eBay, and I have a bunch of these molds I'm going to play with. 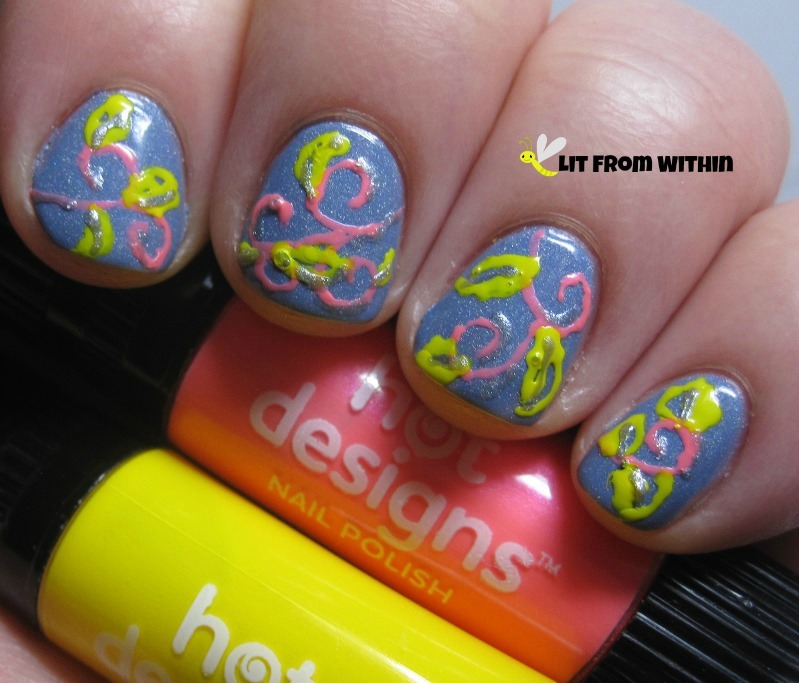 What do you think about 3-D nail art? It's warming up here in Florida, time to start thinking about summer cocktails, days on the beach, and tropical manis! I started with some golden sand - Mentality Euphoria. 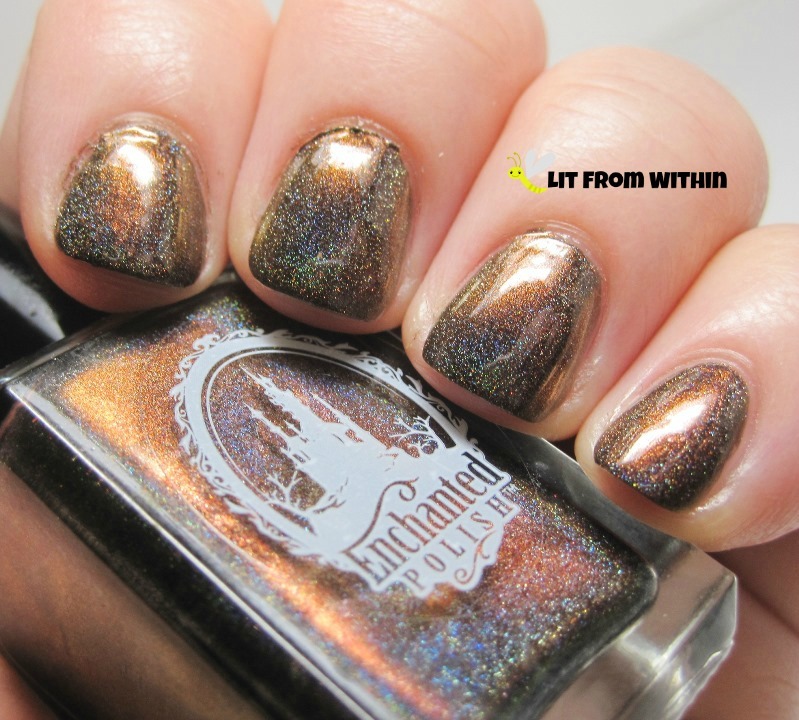 My camera couldn't even pick up on all the holo glitter, it's very sparkly. 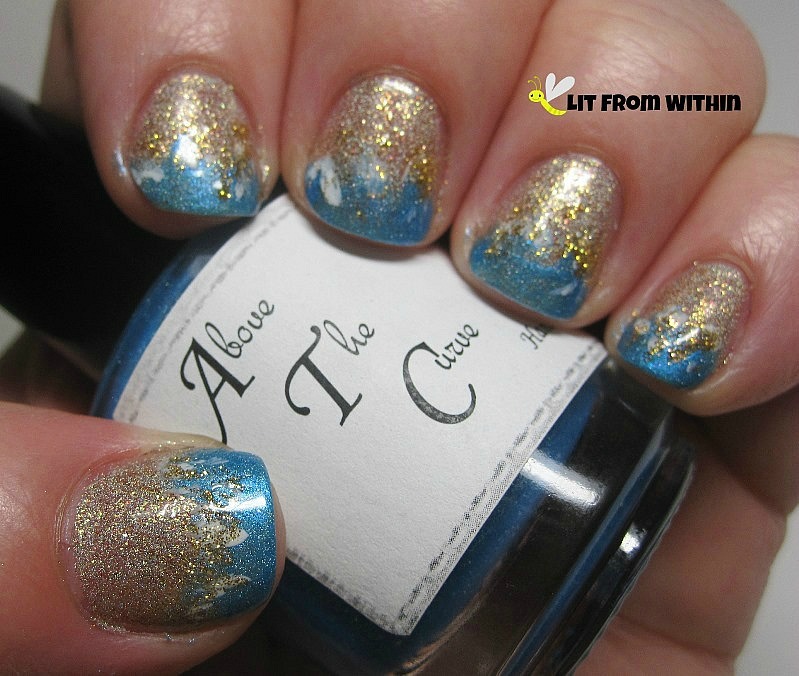 I love Above the Curve polishes, and Prototype Blue felt like the water on a summer's day. 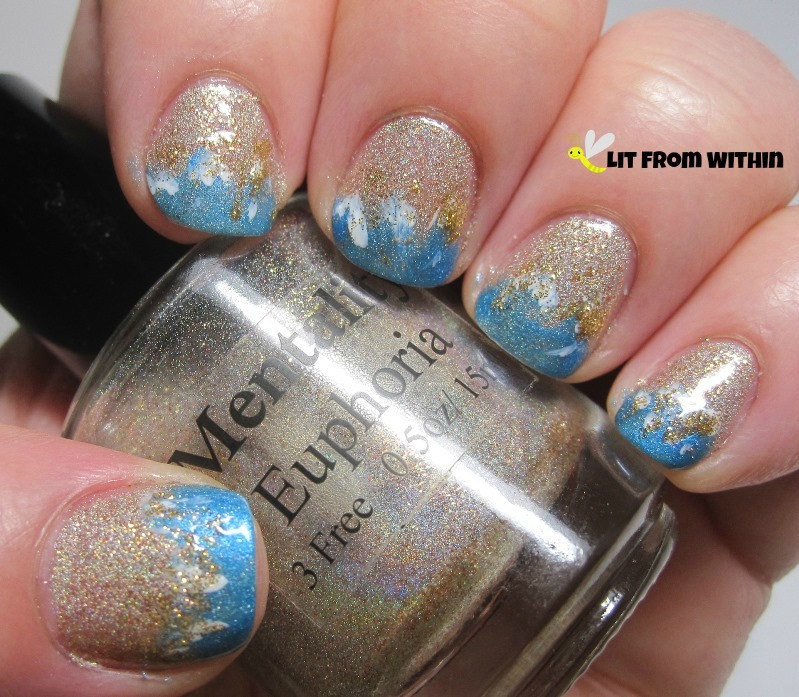 I added a little white and gold glitter with a couple of nail art stripers, because I felt it should be breezy, and there would be small waves in my imaginary tropical paradise. You don't see a tropical drink only because I already drank it. The little umbrella is stuck in my hair behind my ear. 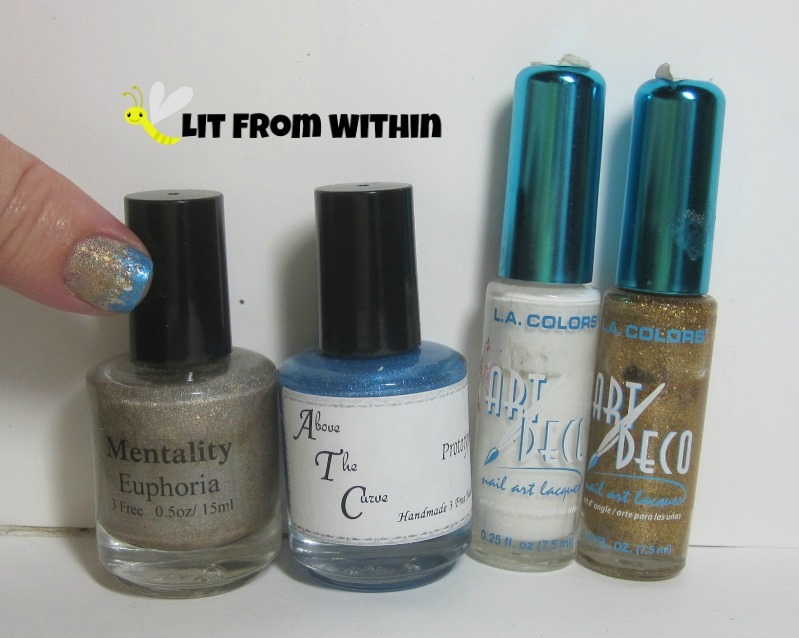 Bottle shot: Mentality Euphoria, Above the Curve Prototype Blue, and nail art stripers in white and gold glitter. 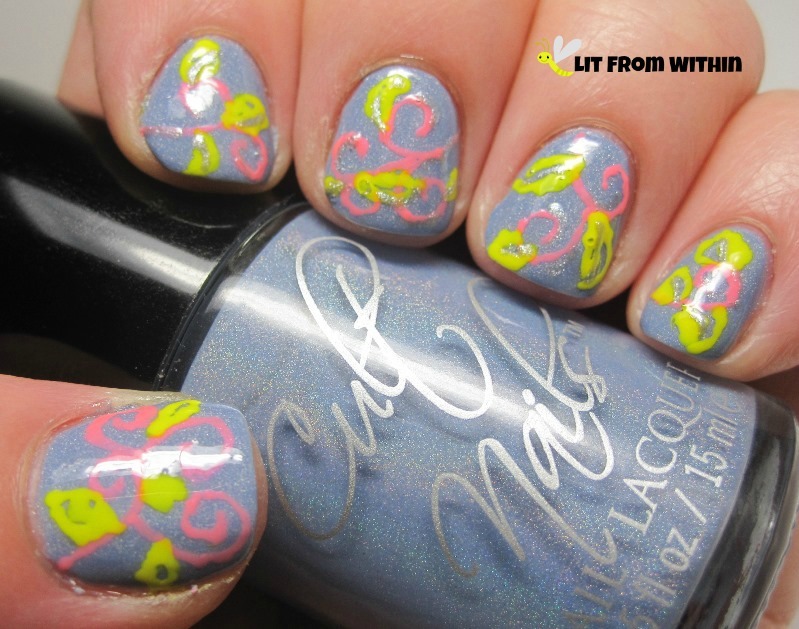 If you could have anything tropical painted on your nails, what would you get?